In about 12 years, the entire baby boomer generation will be older than age 65, and this older population is expected to outnumber children for the first time in U.S. history. By 2030, one out of five people will be of retirement age. Many will need senior care. What does that mean for our society? Family, friends, and anyone working in senior care will all need an understanding of the aging population and the best ways to interact with elderly people. Communication can be complicated by hearing or vision loss, a decline in memory, slower cognitive processing, and physical separation from family and friends. Articulate clearly and distinctly. 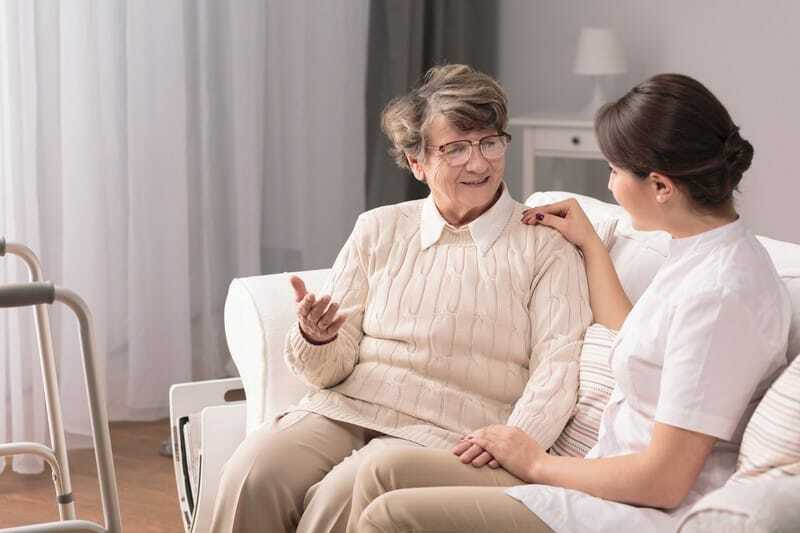 Since many older adults have hearing loss, speak in shorter, simple sentences, just a bit louder, and slower, if you notice they are having difficulty hearing or understanding. Adjust your volume as necessary, being careful to use a gentle voice so you don’t appear condescending. Background noise can be a challenge. Noisy restaurants, music, TV or radio programs all create distracting background noise, making it harder for seniors to discern your words. Be sure you are positioned at the same level – seated or standing – so the older person can read your face and non-verbal language. Laughter is medicine. Humor and a smile are the best icebreakers for building rapport and creating comfort with someone you don’t know. Do you know any good jokes? Learn to listen. Be patient without interrupting. Get comfortable with long pauses without feeling like it’s necessary to fill in the silence. Allow memories to flow. Sharing stories from the past can help someone feel valued. When a senior can share their wisdom and skills, they usually become more comfortable engaging in conversation. Be especially respectful when speaking with aging adults in senior care, keeping in mind that these people have lived most of their lives in a completely different cultural experience. Remember to be patient, also. They often get tired later in the day, as well, making it a greater challenge when trying to learn new things and comprehend new subjects in the evening. Communication is a complex process, but the vast experiences of older adults make time with them invaluable and worth the extra effort that may be required. Be sure your aging loved one has the best senior care possible. Call Concierge Care today at 1-(888) 334-3435 to learn more about how they can be of assistance.